I've been remiss in posting. L3-G0 has visited a school, Children's Hospital, and a few conventions, and attended a Unicode Technical Committee meeting (last post was backdated). He's also gotten a new friend, MCK-Y the Lego MSE-6 Mouse (aka Baby Box) droid. Anyway, here he is at Rose City Comicon. Roaming the halls we met lots of folks, including Master Chief from Halo! It wasn't as crowded as ECCC, so we were fairly free to roam at will, though we always attracted a crowd. Some weren't very well behaved though, vandals! 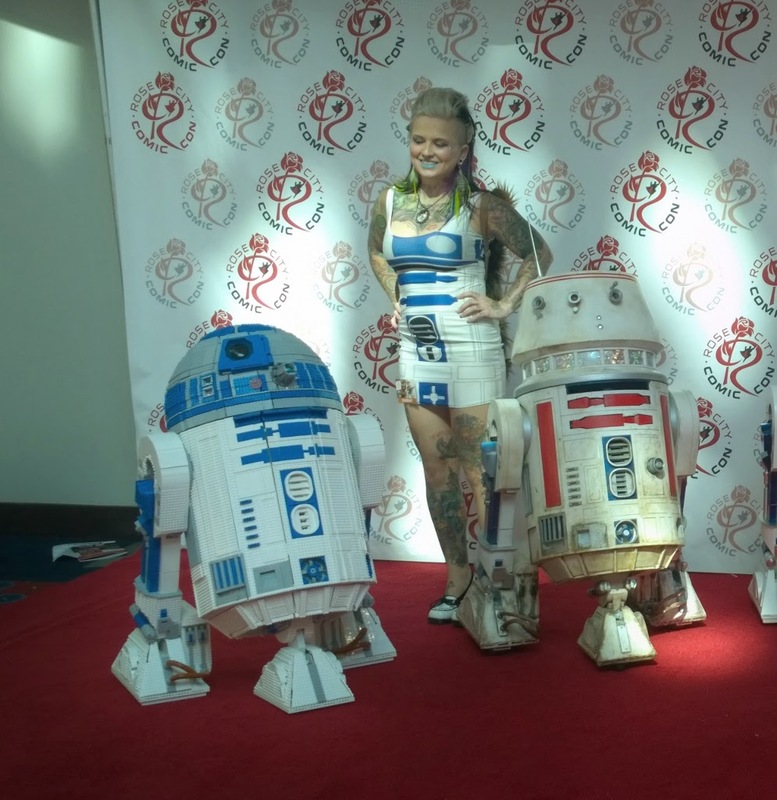 Vandal Attacking Lego R2D2 With a Bat! And, of course, there was tons of other cool stuff. 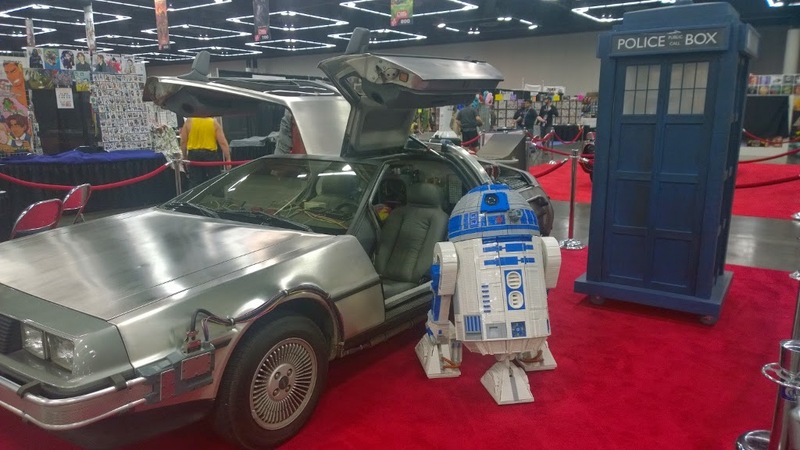 Here L3-G0 poses on the red carpet with a Back to the Future Delorean replica, and a Doctor Who Tardis. 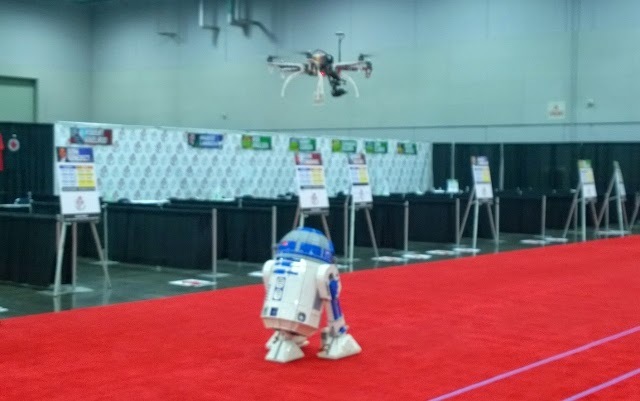 This hexacopter was flying around the celebrity area, Artoo took offence and tried to tell him that it was a no-fly no-camera zone! (I'm still hoping to find his video of this confrontation). While we were in the celebrity area, Wil Wheaton took notice. He was nice. Garrett Wang was also hilarious on the red carpet. He saw L3-G0 while talking to a fan and flew over his table to run up to L3-G0 and take his photo. Startled us terribly. I heard him apologize to his fans when he went back. Oh, no, L3-G0's lost his head! 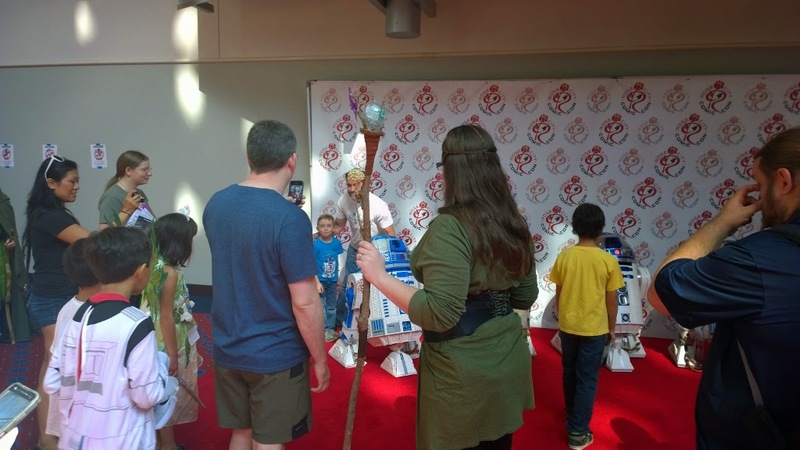 We also participated in the R2-D2 Builder's Club talk about building Astromechs, where we showed off some of our droids and how they are built. 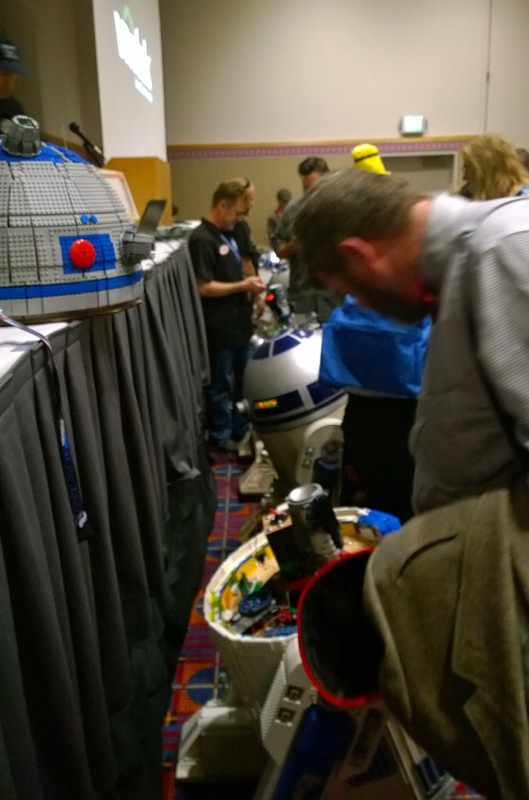 It was a talk like this that helped me decide to make L3-G0, lots of folks get there start building by seeing the other droids at a 'con and seeing such a talk. L3-G0 at builder's talk with head off. Things went pretty well this time around, I guess we're getting better at this. We had two problems: the drive wheels keep slipping on the driveshaft. The chain turns a sprocket which uses a bolt as an axle, but the set screws (on all 4 shafts, he's 8-wheel drive) keep slipping. I tried drilling a notch in the shaft for the set screw to grip, and broke the bit. That seems to have helped the most, having the ground up bit mashed in there to keep it from slipping! Anyway we had to fix it several times. I also drove ineptly (again) and mashed a shoulder (same one) into a vendor's table. The right shoulder's smashed itself 3 times now!!! The lights died right before seeing Wil Wheaton, so we had to come back for a better pix. The other problem is an odd electrical thing. He started freaking out and spraying his mist all the time (he can startle folks with canned air), and his dome started spinning madly. We'd had a similar problem where the mist freaked out, so we unplugged it. Then his dome refused to move. But we thought it was fixed before the con. Last day we had to leave early though. When I got home I checked EVERYTHING trying to repro the problem, but it wouldn't happen. Eventually I replaced the fuse on that circuit (it's the car-type fuses) and he was great. I left his head spinning for a half hour to prove it. What happened is that the fuse was apparently weak. Eventually the dome motor controller got it hot enough that the volts dropped (from resistance), but it didn't blow. That confused the motor controller which was also reading the RC signals, and sent gibberish to the Arduino controlling the mist, and of course it confused itself about the dome's movement. What a freaky problem. What a relief to have figured it out. 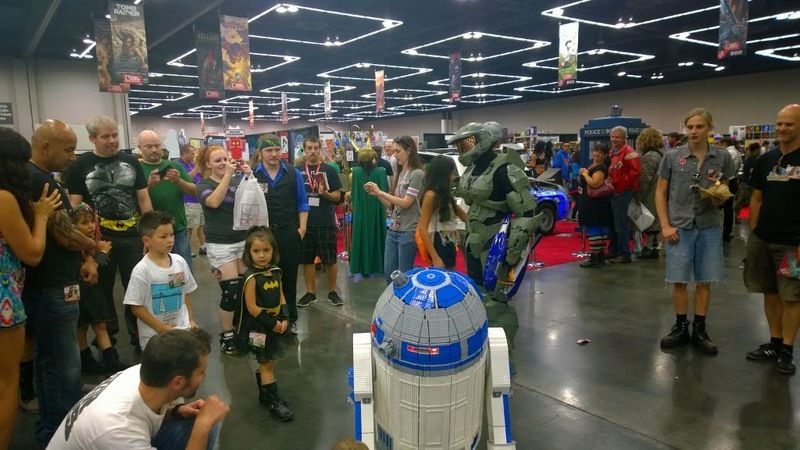 We had tons of fun at Rose City Comicon, we'll try to see if we can make it next year!